Don’t you wish babies came with instruction manuals? Wouldn’t it be nice if there was some kind of tech support you could call every time your baby threw you for a loop? Yeah, there’s Google and WebMD, but what happens when the textbook answers don’t quite fit your questions? If becoming a new mom has you absolutely flabbergasted, I’ve got great news. You have a resource far more powerful than Google resting at the tip of your fingers. That tool, my friend, is mommy bloggers. Women that, just like you, have been new moms and can offer real advice for real-world situations. Here you’ll find the best mom blogs to follow. Some of these blogs are ridiculously popular, others are up-and-coming; all are excellent resources for this new, scary phase of your life. Whether you’re looking for baby blogs, pregnancy blogs, or #momlife blogs, I know you’ll find one that you can fall in love with. That’s My 15 New Mom Blogs to Follow! Before we begin, let me humbly put my blog into the hat. Helping new moms overcome their baby blunders is my passion. I know all about the pressure to strive for perfection with your new little one. So, when baby blunders arise, it can be quite the blow for new moms. I want to help you navigate through the craziness of Babyland with a combination of lightheartedness and practicality. Here you’ll find breastfeeding, sleep, baby care, schedules, and pregnancy tips that are practical, easy to implement, and written by somebody that knows exactly what you’re going through. Plus, you can snag my Sleep Troubleshooting Worksheet when you sign up for my bi-weekly newsletter…but only if you like free stuff that help moms get more sleep ;). ‘KAY! Now that I’ve done some SELF-PROMOTION, let’s talk about some new mom blogs to follow! If you’re looking for a realistic look at motherhood with open and honest advice, you’ll love Mommy on Purpose. Carly’s mom blog is a jack-of-all trades, covering topics about pregnancy, baby care, and postpartum tips, all the way to frugal living tips and blogging. I think my favorite aspect of Carly’s blog is how friendly she is. When I visit her site it feels like I’m getting advice from a wise friend, not some random person on the internet. If your search for new mom blogs to follow tends to revolve around baby blogs, Swaddles n’ Bottles is IT. Caroline’s posts on breastfeeding and baby sleep “training” have saved me many times over. She bases her posts on the questions she had as a new mom, so you’ll find plenty of relevant, relatable material. She blogs about newborn, breastfeeding, pregnancy, and baby gear topics. However, if you have a toddler in the house, you should definitely check out her Toddler Activities section. I’ve actually recommended her advice in my own milk supply post, How to Increase Your Milk Supply FAST. Do you like your parenting advice with a dash of sarcasm? Yeah, me too. Pregnant Chicken is a BIG site with LOTS of resources for pregnant moms and new moms. Amy’s dark sense of humor really brings this blog to life. Just a few of my favorite posts from Pregnant Chicken include, “Breastfeeding for Beginners”, “Glossary of Pregnancy Terms” (I really wish I had read that earlier), and “Interview with a Sleep Consultant”. Seriously, if you haven’t checked out Pregnant Chicken, you need to. It’s great (and you’ll probably get a few chuckles out of it)! As the name suggests, Mom Smart Not Hard (hereby MSNH) is all about making motherhood easier. Alli and Trina tag team this blog. While MSNH is a great resource for baby sleep and pregnancy advice, I think their breastfeeding tips section is where you’ll find the most value. Their Breastfeeding Handbook is highly recommended for new moms and includes a ton of resources (if you’re a checklist person like me, you’ll probably geek out at the printable checklists they include). Also, if you’re looking for a free breastfeeding resource, check out their breastfeeding email course for new AND expecting moms. Alexandra from Coffee and Coos loves to blog about all things motherhood. If you’re looking for advice from a mom who’s been there, Coffee and Coos is the perfect baby blog for you. She’ll take you from the beginning of your pregnancy to that crazy labor and delivery, and finally how to take care of your little bundle of poo–I mean, joy. My absolute favorite aspect of her mom blog is the section dedicated to birth stories. I mean, WOW! These mamas have shared powerful (and super encouraging) experiences. I don’t know about you, but I’m a sucker for listening to empowering stories. It truly does take a village to raise a child. And, guess what? Imperfectly Perfect Mama is that virtual village! While this site isn’t specifically for new mamas, it hosts the voices of dozens of women that can make your journey through motherhood so much easier. A few of my favorite posts are Living on One Income, and How to Support Your Husband as a New Dad. When I began creating my list of new mom blogs to follow, I KNEW I had to include Fennell Seeds! Are you a freak for practical, clear-cut tips? If so, you will love this blog. Carolyn’s baby tips are simple and so, so easy to put into practice. Her posts are so much more than babies. She goes over several different aspects of motherhood, such as home organization tips, traveling with kids, and mommy fitness. I think one thing that new moms need more of is real, unfiltered advice. That’s why I love Michele’s mom blog, Confessions of Parenting. Michele is a Family Life Educator/Mommy/Step-Mommy/Wife/Blogger. While her blog provides practical baby tips and motherhood advice, I think you’ll love her unfiltered Life UnEdited posts the most. The fact is, motherhood is not butterflies and rainbows…and sometimes weird, crazy (and maybe a little disgusting) things happen. Check it out if you enjoy diving into the life of other moms! Okay, I realize this baby blog is for a pretty specific niche, but the Chronicles of a Babywise Mom is, hands-down, one of my top new mom blogs to follow. When I first became a mom, I visited Valerie’s blog at least three times a day. Oh, Mama, let me tell you. First of all, I’m a Babywise Mom (On Becoming Babywise is a baby sleep book that I discuss in this post). Her blog provides practical tips on how to implement the principles from the -Wise series in your own life. I don’t think I would have been so successful with Babywise if it hadn’t been for her blog. Also, I love her blog’s format. She has a blog index BY AGE, which is incredibly helpful when you’re trying to figure out appropriate nap times, milestones, etc. Her blog is like a quick reference sheet for babies! Even if you’re not much of a baby sleep schedule fan, it’s definitely one of my top recommendations for new mom blogs to follow. If you ARE a fan of baby sleep schedules, check out my From Sleepless to Slumber Series to get started! During the craziness of new motherhood, sometimes we forget to take care of our mental health. So, let me ask you, Mama, do you suspect that you’re suffering from postpartum depression? How about your baby? Have you noticed signs that something might be off? Check out the Parenting Pod. This unique collaboration of experts can give you the answers you’ve been searching for. They focus primarily on family mental-health but have several safety-related posts as well. They offer a great in-depth resource guide on postpartum mood disorders and mental health issues for children and babies. The Parenting Pod also has an excellent baby products review section and has probably one of the most impressive car seat safety series EVER. Oh boy, where to begin? Jenny’s blog is such a resource for your first couple years as a new mom. This baby blog is incredibly detailed. Where one blog might have a post about choosing the right sippy cup, Jenny literally has an entire section devoted just to sippy cups. She has product reviews, baby tips, mom hacks, extremely detailed infographics, videos… I could go on. If I had to narrow down the new mom blogs to follow to just five, this one would definitely be in the running. Do you ever wonder if you’re doing it right? This whole parenting thing? As a new mom, it’s easy to become intimidated by the idea of discipline and shepherding your baby’s development. Allie’s new mom blog focuses on the topics that every mom wonders about: sleep, discipline, and developing language skills. How you do you survive a blackout with a baby? What happens when your toddler suddenly turns into a hellion that doesn’t know the definition of no? These kinds of things happen to every mom, but often times we have no clue what to do! Enter, Michele from Mommy with a Chance of Showers. Her mom blog gives creative, practical advice for real-world situations. On top of that, as a Special Educator, Michele has a ton of great ideas for baby and toddler activities and advice for parenting special needs children. What if I told you that you can be a new mom and still look absolutely stunning? Some days I have trouble believing it too! I used to love reading lifestyle blogs, but as a new mom, I barely have time to shower, let alone artfully apply makeup. That’s why I love Life of a Babe. Mallaury’s lifestyle blog has easy fashion and beauty tips for moms. Not to mention, she provides some awesome pregnancy and breastfeeding tips that you don’t want to miss. We are so blessed to live in an age where information is so readily available. If your baby has your head spinning and you’re searching for answers, I am confident these women can help. And don’t forget, I’m here as well. So, what do you think of my best new mom blogs to follow list? Did I miss a really great baby blog? Or, better yet, are you a mommy blogger that loves to help new moms? Let me us know in the comments below! This is such a great help! Thank you for posting this,I appreciate it a lot! This is a great round-up of excellent mom blogs! I know some (Pregnant Chicken is always a go-to) and will definitely check out the others. And I can confirm that Life of a Babe is a great site and that Mallaury is beyond nice–so glad you included her on the list! Great post. Mother Haggard is awesome too! I especially love your outfit of the day…mostly because that’s literally my wardrobe right now, haha. Wow, I must say this is another great piece of information. I appreciate your effort. New parents should be happy getting this information. Hey Erin! Thank you so much for including me among these truly amazing moms and their blogs! I am so honored that you think our blog can help new moms! I love that as moms we are able to help one another as we all go through our journey of motherhood! Hi Erin! I’m honoured to have made this list! 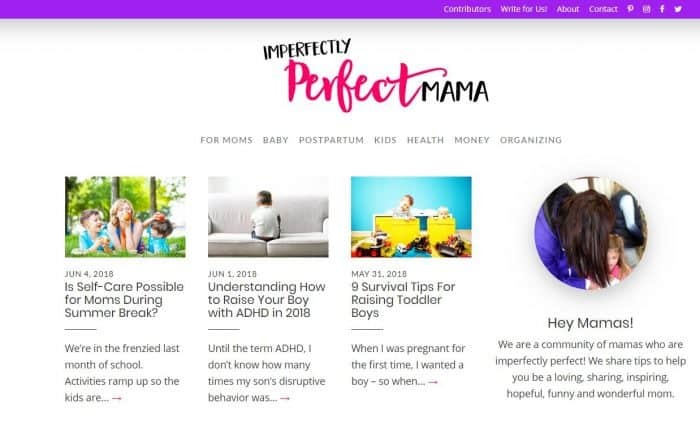 Thank you so much for featuring us mommy bloggers on your platform, and for sharing with other moms helpful resources to help them on this journey called Motherhood. Of course! Your blog is excellent. I can’t wait for other mamas to check it out!